I love this card but the best part about it is how it ended up in my hands! 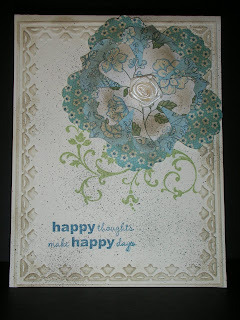 A fellow demonstrator and really nice lady, Robin Merriman, gave this card out as a swap at Stampin' Up! 's Leadership Conference. My upline and friend Stella MacKay received it from Robin and then used it at our February downline meeting for a Make & Take. Thanks Robin for such a beautiful idea and thanks Stella for sharing it! The card uses the Elements of Style stamp set and the Apple Blossoms hostess set, as well as the Fun Flowers die, Framed Tulips embossing folder and the vanilla Rosettes from the Occasions Mini Catalog.